Eggs: scrambled, fried, hardboiled… However you like them! I also found that I could cook up an “omlet” using the Ziplock brand “Zip ’n Steam” bags and add some cut up veggies and cook in microwave for 2 minutes. These were perfect for work! I used 2 eggs. Eggs are great over a baked sweet potato too! I love avocado with eggs too! Sweet Potato “Toast”~ cut sweet potatoes into thin slices. Toast in toaster on highest setting for about 3 cycles. Serve with almond butter on top! Great for those times that you’re craving toast. Try to fit veggies into your breakfasts. I wasn’t always great with this. But I did find that I could cook up zucchini and tolerate that ok in the morning. Or cook veggies into eggs, or make egg cups with eggs and veggies in a muffin tin. Some days were just a Lara bar and apple, or a banana with almond butter. Not perfect, but did the trick on a busy work day. 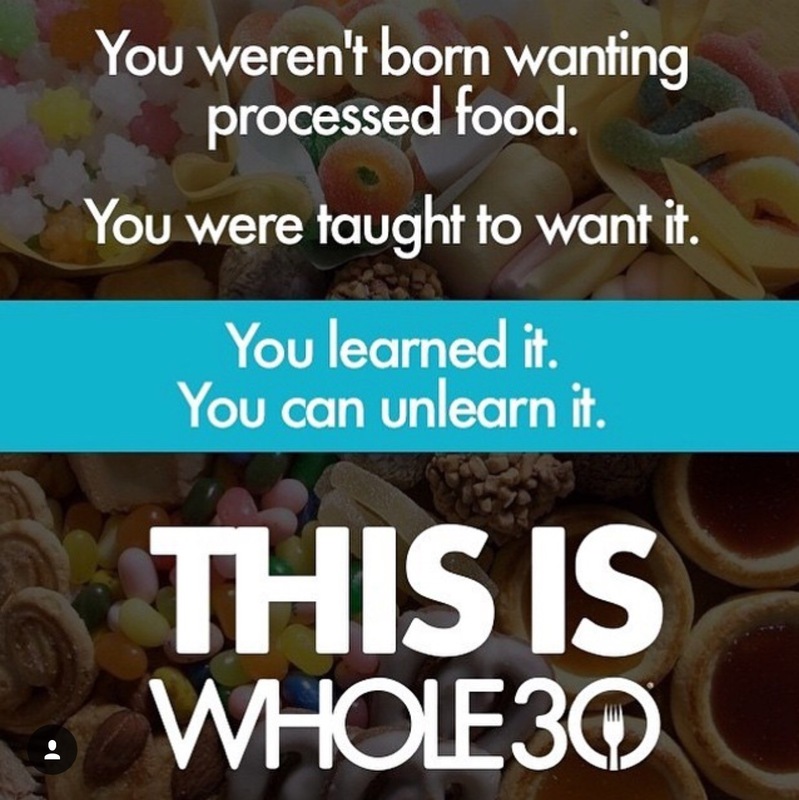 Paleo “pancakes/muffins” and smoothies are not “allowed” on Whole 30. They want to break you away from any foods that might cause cravings or the “sugar demon” to come back. Also, I found that the more variety I tried to include, the harder it was! Keep it simple. This makes a great dinner or even breakfast! Meijer has the Adelli’s Chicken and Apple Sausage, and it is Whole 30 approved. A little pricier, but stock up on it when it’s on sale and freeze your extras! I double this recipe for leftovers, and you can add cinnamon if desired. This is my favorite paleo recipe! It’s great in a lettuce wrap, on a salad, plain, or over cauliflower rice. Jon and the boys ate it on hamburger buns. I used Liquid Aminos instead for the Soy. Also, make sure you double this recipe because your family will eat it up! Serve in a lettuce wrap or over cauliflower rice! Serve these over “Zoodles” (buy a “Veggeti spiralizer, which I have seen at TJMaxx in the kitchen area for about $7 to spiralize zucchini!) I served the boys’ meatballs over regular spaghetti noodles. They loved the meatballs, and it was a fairly easy recipe to make! This was so good! I served it with baked potatoes and saved some of the avocado mixture to put on my potato as well. Skip the ketchup. And be careful about what spices (if any) that add to the burger. A lot of them contain soy and/or sugar. Whole 30 technically doesn’t include snacks because they want you to eat enough at each meal to keep you full till the next meal. However, they do understand that you may need a snack before or after a hard workout, or if a meal is delayed. The best snacks are: Lara bars, Rx bars, fruit with almond butter, nuts, hard boiled egg, veggies, or some leftover protein from another meal. Don’t try to fulfill your sugar cravings with fruit or Lara bars though, or you won’t break free from the cravings! Also, you can’t make paleo desserts during the Whole 30 challenge (even if it’s all “complaint” ingredients”). 1. Read spice mix ingredients carefully! I was shocked at how many had SOY (which is horrible for women~ it increases estrogen levels and can also lead to cancer!) It’s easy to make your own spice mixes! 2. I use Tessamae’s Ranch salad dressing, found in the produce isle at Meijer by the Bolthouse salad dressings (near bagged salads). It’s $5/bottle, but a total time-saver. You can make your own dressing, I just didn’t take the time to go get an immersion blender 😉 They also make a Tessamae’s ketchup, but I thought it was pretty gross. Save your $5. 3. I bought produce saver containers at Meijer in the storage container/kitchen supplies section at Meijer. They have a little “tray” in the bottom of the tupperware that keeps the lettuce and other veggies from wilting! Kept mine crisp all week! Mine came in sets of 2. I used the large one for lettuce, and the small ones for cucumbers and peppers. (I bought 2 sets). 5. You can make your own cauliflower rice using a food processor, but they also sell it already made at Meijer and Sam’s Club for pretty cheap. I buy it frozen and just portion out what I’m going to use! 7. Lara bars are a great snack to keep in your purse for emergencies! Just make sure that they don’t contain peanuts (which are a legume, not a nut) or chocolate. 8. RX Bars are great too, but a little pricer. Again, watch the ingredients. They are found on the bottom shelf of the Lara bar section in the cereal isle at Meijer. You can also find Epic bars right next to there, which are compliant as well. It’s a softer form of jerky. I wasn’t a huge fan, but I know a lot of people who rave about them. 9. Make a bunch of “salad in a jar” recipes for the week! In a mason jar, layer your salad ingredients (starting with the “wet” ingredients like cucumber/peppers first) and ending with your lettuce on top. Dump it onto a plate for lunch the next day and you have a beautiful salad! I made about 3 days at a time and would take them all to work at the beginning of the week. Take protein on the side to add. Some of the jar recipe sites suggest putting your dressing in the bottom of the mason jar first. I felt like it made the veggies slimy, so I just took my dressing separately. Also, add a 1/2 avocado. Yum! 12. Feed your family what you eat! My first few attempts at Whole 30 failed because I was trying to cook separate meals for everyone! This time around I fed them what I ate, but would add to their meals (ex: if I had zoodles, they could have regular noodles; or add a hamburger bun to their burgers and I had mine in a lettuce wrap). Keep it simple. I lost a total of 8.6 pounds and 10 total inches off of my body! I was really tired the first week (sugar withdrawal!) Before Whole 30 I was having really bad stomach pain and bloating whenever I ate. Whole 30 took that away. My cravings DISAPPEARED. It was hard at first, but SOOOO worth it. You can do it! Let me know if you need any support!